Paganism and idolatry are real. Those who live in the West seldom see people worshiping or offering sacrifices to idols, but paganism is as real today as it was in the time of the Bible. Idolatry is not just a metaphor for materialism, it exists in a physical and tangible way as well. Paganism is not just something for the history books, but it is something every believer must guard against even today. Christian theology teaches that Jesus’ death and resurrection cancelled the Levitical sacrifices, but this assumption raises some serious problems. In four engaging lectures, Torah Club author D. Thomas Lancaster takes us into Leviticus, Hebrews, and the Messianic Age to come, to reconcile the contradictions between old and new. The modern Messianic Jewish movement is birthed out of Christian missionary efforts to evangelize the Jewish people, but how does the rediscovery of Torah impact that original mission? In a series of five lectures, Torah Club author D. Thomas Lancaster considers the implications of trying to bring the Gospel to a post-modern world from a Messianic, Torah-based perspective. Most believers have been taught an obligation to give a tenth of their income to their home church, but is this really what the Bible requires? First Fruits of Zion teacher Toby Janicki attempts to answer this question and more as he takes you on a fascinating biblical and historical study of the obligation of tithing. What does the LORD require of you? The traditional Christian view of Heaven and Hell assumes that both exist. Beyond that, Christianity disagrees with itself on what Heaven is, what Hell is, who goes where, and how long they stay. 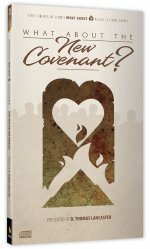 Does the New Covenant really replace the Old Covenant? Christian replacement theology is solidly based on a misunderstanding of the meaning of the new covenant. The church teaches that the new covenant cancels the Torah and God’s covenant with the Jewish people. Discover a truly Messianic Jewish vision: Messianic Judaism for All Nations, a worldview founded on the land, the people, and the Scriptures of Israel, regenerated in the resurrection of Yeshua, and looking toward the coming kingdom. Will the Messianic Jewish message of the kingdom survive into the next generation? How can we engage the next generation in Messianic Judaism and Yeshua faith? At First Fruits of Zion’s 2016 National Conference, the focus was on raising up a new generation of disciples—new wineskins for the new wine of our Master Yeshua’s teaching. The rediscovery of this important, early apostolic work has practical ramifications for the Messianic Jewish movement today, particularly regarding the faith and practice of Messianic Gentiles. This conference works through key concepts of kingdom living and simple instructions for the path of authentic discipleship to Yeshua. "The People of Israel Live!" What is the future for Messianic Judaism? Twenty-years ago, the Spirit of the LORD kindled something new, and the ministry of First Fruits of Zion was born. With the teachings and resources of First Fruits of Zion, Christians and Messianic Jews began to rediscover the Torah. Two decades later, First Fruits of Zion and the Messianic Jewish movement still lives, breathes, and is ready to thrive. Am Yisrael Chai breaks new ground as we present our game plan for the future of Messianic Judaism, for Jewish believers in Yeshua, and for Messianic Gentiles from all nations. Catch the vision, become a solid member for change—be inspired to kick-start a fresh revolution by learning practical ways to facilitate study groups, Torah studies, and other outreach efforts. Sometimes it may feel like Jews and Gentiles are unequally yoked as we all seek to take on the “yoke of the King.” Get a new, fresh, powerful, uniting vision for the future of Gentiles in Messianic Judaism. Discover the path of the biblical God-fearer, and let the Sabbath, the festivals, and the Torah lifestyle shape your walk with God. Unravel Galatians and the teachings of Paul. Embrace Torah along with Israel rather than in place of Israel.